Ter voorbereiding van onze reis naar Amerika heb ik eens uitgezocht of we met ons fototoestel (een Canon EOS-400D) ook HDR foto’s kunnen maken. Find a nice place for the camera where it can stand on it’s own. You must not touch the camera when the shutter is open. Then press the shutter button and wait 10 seconds for the camera to start shooting. It will make 3 successive shots automatically. The setup should now look like the screenshot on the right. 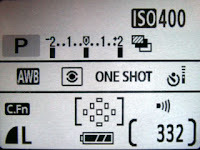 If you are not content with your picture series, manually change the basic exposure and re-shoot the entire series. Now you can load the pictures to your PC and use your favorite HDR software to create magic pictures.